EPA Administrator Scott Pruitt isn't popular on the internet. An internal memo obtained by E&E News under the Freedom of Information Act details "open-source internet checks" in a review of threats against Pruitt. The document, dated last Oct. 17, was prepared by an EPA special agent on Pruitt's security team for Pasquale "Nino" Perrotta, who led the agency chief's detail before retiring earlier this year. The memo says a multitude of social media posts had been directed at the EPA chief, including some wishing him death, but there was no actual threat to Pruitt's life. "There are hundreds if not thousands of posts, messages, tweets, comments, and so on across numerous social media platforms of general unhappiness towards Administrator Pruitt, surrounding what many perceive to be his controversial positions on topics such as climate change, energy, and the environment, and also due to a slew of negative attention directed toward the Administrator in the media," said the memo. "While many of these posts go so far as to wish for the Administrator's death; to date, no evidence of a direct threat to the Administrator's life or physical well-being has been uncovered." Senate Democrats cited the memo when questioning EPA's expansive security for Pruitt — payroll and travel costs for the administrator's detail have spiked as Pruitt has 24/7 protection. In an April 10 letter calling for a hearing on EPA's security spending for Pruitt, Democratic Sens. Tom Carper of Delaware and Sheldon Whitehouse of Rhode Island referred to the document (Greenwire, April 10). Carper and Whitehouse said in their letter that the memo also states that at the time, there were "no known investigations underway concerning threats to Scott Pruitt" by the Joint Terrorism Task Force. In E&E News' version of the memo, information from the JTTF has been redacted and forwarded to the FBI to determine if it can be released. 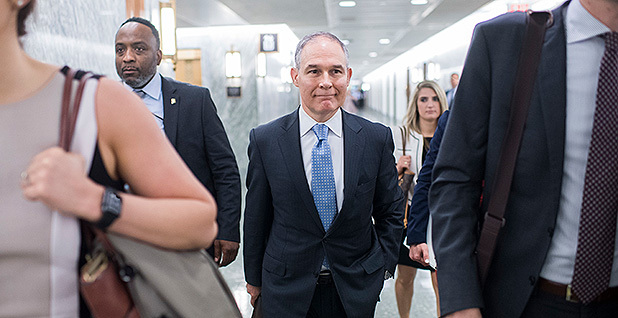 Pruitt will appear before the Senate Environment and Public Works Committee this August, where he will likely be pressed on spending for his security detail as well as other ethics allegations swirling around him. Carper is the ranking member on the panel, which includes Whitehouse as a member. EPA's Office of Inspector General is also reviewing agency spending on Pruitt's detail and expects to issue its report on the matter this summer. Asked about the memo downplaying threats against Pruitt, EPA spokesman Jahan Wilcox said in a statement that the administrator "has faced an unprecedented amount of death threats against him." EPA has spent roughly $3.5 million on pay and travel for Pruitt's security detail during his first year in office, surpassing security costs for his Obama-era predecessors. Wilcox said EPA will disclose the detail's costs on a quarterly basis. "Americans should all agree that members of the President's cabinet should be kept safe from violent threats," he said. EPA's security costs continue to attract scrutiny. The Intercept reported this week that the agency had purchased several security-related items, including a breaching kit and "tactical pants." In a statement, Henry Barnet, director of EPA's Office of Criminal Enforcement, Forensics and Training, said these were "routine expenditures for our Criminal Investigative Division (CID) and Protective Security Detail (PSD) agents to have proper attire for search warrants, arrests, disaster responses and training that go back multiple administrations." "This attire is not used for protection work," he said. The memo also refers to an Aug. 16, 2017, summary of threat investigations related to Pruitt and others at EPA, which was drafted by EPA's assistant IG for investigations, Patrick Sullivan. The internal EPA watchdog, which investigates threats against agency personnel and facilities, later said in a May 2 letter that Sullivan's memo was the only document of its kind produced by the IG and came at the request of Pruitt's security detail. It contained law enforcement-sensitive information and was not to be shared outside EPA — CBS News would later report on the memo before it was released under FOIA. The EPA IG has opened more threat investigations related to Pruitt compared to prior administrators from the Obama administration, but some observers have questioned the gravity of those threats against President Trump’s EPA chief. And as indicated by the special agent's review of social media, investigations by the IG of online threats made against Pruitt have not turned up much. Investigators looked into one person who in April last year wrote "a threatening post" on Twitter against Pruitt and Senate Majority Leader Mitch McConnell (R-Ky.). The individual later apologized and said he or she had been drinking while watching liberal commentator Rachel Maddow, according to an IG report. Another report by the IG detailed an investigation into a tweet that could be seen as "intimidating and potentially threatening towards" Pruitt. The person responsible for the post said he or she wanted to express "displeasure" with the EPA chief, not threaten him, and picked the first unhappy GIF he or she found to go with the tweet. Carper and Whitehouse's letter also cite other internal EPA records questioning Pruitt's need for security. E&E News has filed FOIA requests for those documents, as well — including for a Feb. 14 memo by EPA's Office of Homeland Security intelligence team that said, "EPA Intelligence has not identified any specific credible direct threat to the EPA Administrator," according to the senators. Earlier this month, EPA said in an email to E&E News that there had been "a significant increase" in FOIAs flowing into the administrator's office. E&E News' request for that document was then No. 1,275 in the queue for a response.